It's 42 degrees in Pure Florida as the sun rises. Yesterday I walked through my woods looking for the Halloween Tree. There were a lot of gnarly candidates, but I couldn't seem to make up my mind. This could be the last Halloween tree with all of us home and I wanted it to be a good one. I walked through the planted pines, behind the never miss pistol range, down the go kart trail, into the unknown corner, past the pit of paleontology, and was about to turn towards the pond of dessication, when ... there it was! Along the fence of leanoverness, a scrubby turkey oak was sporting a twisty branch just begging to become this year's Halloween tree. I whipped out my Razorback pruning saw and soon the tree was in place. Some of you, (probably those of you in the front row who pay attention), may remember my illegal dump scavenging post and the amazing jar of wonder I pulled from beneath the "Scavenging Not Allowed" sign. That jar is now clean, filled with pebbles and is the support base holding up our Halloween tree. The tree is behind me as I type this morning. I roughed it up some yesterday to give it "the look" and now all it needs is Emma the Halloween sprite to direct it's decorating. She is our holiday cheerleader, always the first to dig stuff out and start decorating. This isn't really the Halloween tree post, it's just that all that searching yesterday made me think about plants and the memories associated with them. The Halloween tree is just one example. The wishing leaf from a few posts back is another. Aunt Florence's guava tree. Aunt Florence was my Dad's sister and loved her plants. 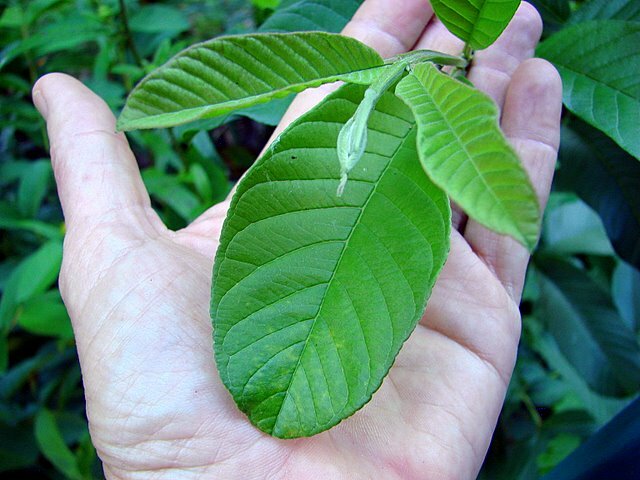 The tough, cold tolerant guava in her yard would occasionally make fruit, a rarity in North Florida, for this is a very tropical plant.Mostly it was just a green shrubby bush. Not too long before she died, Dad gave me some suckers off her plant, and they are now growing near my porch steps. Aunt Florence, her husband, son, and two daughters are gone now ... an entire chunk of my extended family that is no longer with us. My Aunt Florence guava never bears fruit, but it is laden with memories. Horsemint and gaillardia take me back to those heady days, just out of college, when I was going to be a famous freelance nature photographer/writer. This picture was part of my first paid, published article in Florida Wildlife magazine back in the '80's. There were a few more, but as responsibility crept in, there was a need for more reliable paychecks. Datil peppers will forever make me think of my grandfather who was THE datil pepper man in St. Augustine for decades. 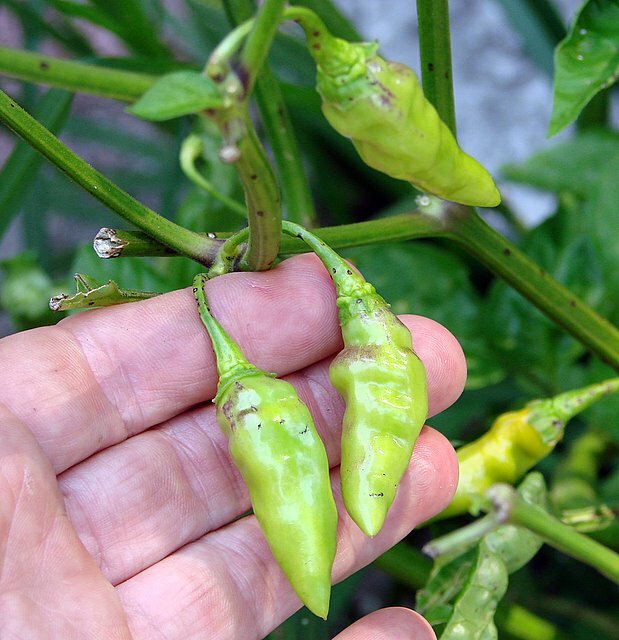 Everyone in town knew where to get the best datil pepper plants ... and a story. He could tell a tale. At his funeral, datil peppers were slipped into the open casket by my uncle. I have always thought that simple gesture of love would have made Papa very happy. The pindo palm above is a descendent of a pindo that grew outside my first classroom. One day after school,I heard a thump, thump, outside my room so I went to investigate. A small pack of little kids were tossing a broken brick up into the tree to knock down the edible fruit. It was a moment out of prehistory. This could have been Lucy and her tribe on an African savannah a few million years ago. This modern tribe thought they were in trouble, but I took the brick and knocked down a shower of fruit (after a warm up toss that didn't count). It was kind of like a palm pinata scramble at that point, but I did manage to grab a few of their cast off seeds and plant them later. This one grows at my Mom and Dad's place. The parent palm was cut down along time ago, the little kids are all grown, but I can see them clearly when I see this tree. There's alot more of course. Lucky for you Blogger will only let me post 4 pics at a time. Of course, it would be alot more interesting to hear about your memory plants. ... rustic ... yeah, like us, very rustic. FC, I don't know how, but you do it every time...with a few simple words you speak to our hearts. I keep plants too, given to me by friends and loved ones, that remind me of them every time I pinch a leaf or dump in some water. Grandma Peggy's (Ralph's mom) strange and wonderful fern, (which I finally managed to grow babies from after years and years of planting seeds. )My own grandmother's Christmas cactus. A split leaf philodendron from the folks I lived with when I was in college...I could go on and on. Never thought of calling them memory plants, but that fits so nicely. Nice post - tugging me out of lurkdom to comment. Can't say that I have many memory plants, other than African violets which remind me of my mom - I keep buying them and killing them - just don't have the knack for them. I do have plans to *borrow* a few pips of the lily of the valley that grow beside my childhood home tht was sold last year. I hope not to have to do it under cover of darkness. When I look out into our sunroom, where all of our plants sit in the windows, I know the history of every one of them. There are two in particular that always tug at my heart. One was a given to me by co-workers nearly 15 years ago right after my father died. It was on my desk when I returned to work. The other is a straggly pothos that I have been trying to keep alive since my mother gave it to me ten years ago. It was an old plant then, one that my father cared for for nearly twenty years. It's hanging on, but I always wish it were more robust. We had to leave some of our favorite plantings in Santa Cruz. A wonderful lemon tree, fig tree, and mulberry; all incredibly productive, and all a gift from my older brother. Ok, I've recovered from the slaughter that was last night, and now, at last, I can comment. And this was was a great post! I've never thought of plants as memory plants until now. I have two orchids, one from my mom and another that her brother gave her, which she passed on to me... and it's true, whenever I see the plants, I think of them. This was a great idea..a memory plant post! 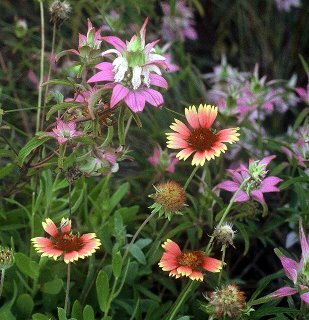 Unfortunately, most of the plants in our yard have only memories leading toward the Home Depot. But I remember the day we bought them! lol. Can't wait to see the Halloween tree! Rustic is the best way to go sometimes. we have a pine in the front yard that started life as a tiny potted christmas tree at our old house, probably close to 15 years ago. now it towers over the house. the back yard and open hillside behind us are planted with several trees [mostly oak and laurel] that my husband "raised from pups," having collected acorns and seeds on hikes with the dogs, boy scouts, and our kids. for a while, we had a miniature tree farm in the kitchen, atop a cabinet and under a skylight, where he coaxed the little guys to sprout. there are still a dozen or so small trees in pots outside, waiting for johnny acorn to find them good homes. we also have a giant sequoia in a large tub, my son's souvenier of a great camping trip to calaveras big tree state park when the kids were little, maybe 10 years ago. it was twig-sized when adopted, and is about 4 feet and sturdy now -- hanging in there although the habitat is not ideal. my daughter had a redwood sapling from the same trip, which flourished and was planted in memory of a wonderful classmate who died of cancer. I'm sorry to hear about your Aunt Florence and her family. The special guava bushes that you have from her remind me of my own relative, now departed, who had an ability with guavas (jelly, ice cream, sauce) that was part of our family's traditions. The guavas and the associations with her will always be remembered -- as with your Aunt Florence, I am sure. So... are any of those plants good at inducing labour? Or, do you have any plants (besides the Halloween Tree) that are specifically related to memories of YOUR kids? Thank you, I'm glad you liked this post. Do you baby the Christmas cactus to get it to bloom? My parents keep theirs in the dark for so many hours to make it bloom .. not sure of the details. A ninja style pip gathering sounds like the making of a post! Sounds like your sunroom is full of history. A lot of ours have no more history than the ride home from Lowes or HD too, but some amaryllis we have go back to my great, great grandmother's Pennsylvania farm. You would not believe the similarities in our stories. We have a towering cedar tree that was a potted Christmas tree 18 years ago and I also have various tree seedlings going on the window and on the porch from time to time. I am Johnny wild blackcherry seed. Thanks for the kind thoughts. Guava jelly also makes me think of my Papa, that and guava paste. The paste came in wrapped and in a small wooden box and he loved it. I'm sure some herbalist, crystal rubbing guru type has a plant for that, but I still suggest the Robin Williams tape. I can't think of a plant that brings up kid memories, they all seem to be (mostly) about older relatives of mine. Now I'm not very good at growing things but I do try! 9 years ago we went to Vegas for Thunders family reunion. His uncle Walter had these magnificient plants in the corner of his yard. Someone had given him dates and he planted them. I was in awe with these plants and REALLY wanted one. I managed to bring it back to Ohio and it is still growing like crazy! 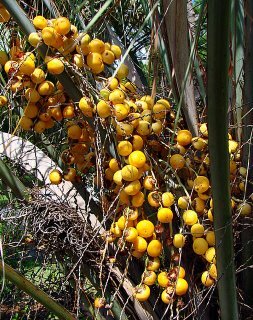 We can't wait to plant "Uncle Walter" (As we call him) in the ground in Florida and some day have a beautiful date palm of our own! PS: We forgot our datil pepper seeds the last time we saw you guys, maybe next time! A date palm in Cin city? Cool. I can mail you some datils if you need them before then. What does that fruit taste like? I'm still stuck on the Halloween tree. This is new to me. I had to move away and leave all of my memory plants but it gave me reason to begin new ones. I also loved hearing about your memory plants. We had a guava bush and it always had fruit on it. I've never heard anyone else ever mention one before. The last few days of riding we have run into two separate wildlife photographers getting up really close & personal to flowers or maybe bugs. It's something I tend to do, but they have fantastic cameras. I say kind of like a loquat and my brother said... what did he say? Oh well, the conversation was two weeks ago. I think he said pineapple. The kids have been so busy that it is still bare. It was easier when they didn't have all these separate places to go. I promise to post a pic when they get it garnished. Surely not in Kentucky? Guava? I was doing some bug photo'n just yesterday. This was an excellent post! Made me miss the old home place. Thanks for the memories. Thanks. Neat to think that any plant you plant could become a memory plant.